I am currently experimenting with using a virtual machine for my development. 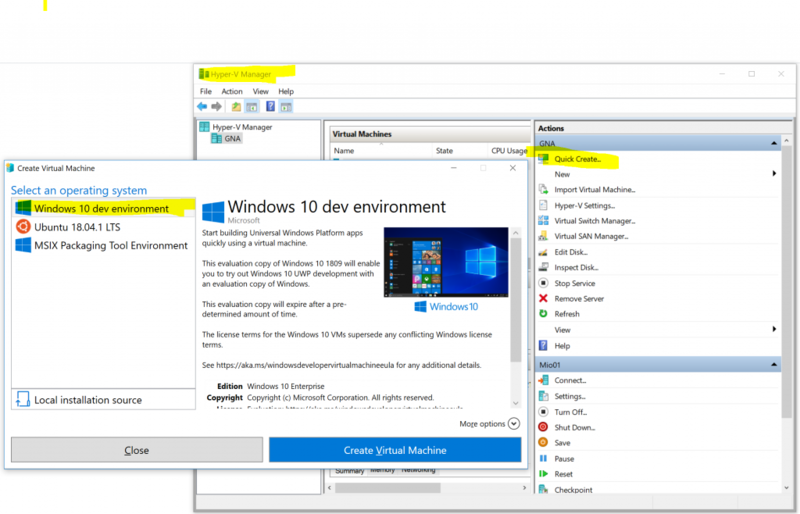 I have earlier done it through OSX/Parallels but now I am trying a Win/Win solution with Hyper-V.
Every third month, that is for how long the license is valid, I do a Hyper-V Manager->Quick create->Windows 10 dev environment. It comes with Visual studio and some dotnet preinstalled. All I have to do is start VS and tell it to update itself, and update dotnet core, and start VS installer and update with Web and Azure and whatnot I need for developing. Then I need Git, Notepad++, VSCode, Keyboard1337 and BecerroInamovible. Ergo I need Chocolatey too. Fire up a console with elevated priveges. @"%SystemRoot%\System32\WindowsPowerShell\v1.0\powershell.exe" -NoProfile -InputFormat None -ExecutionPolicy Bypass -Command "iex ((New-Object System.Net.WebClient).DownloadString('https://chocolatey.org/install.ps1'))" &amp;&amp; SET "PATH=%PATH%;%ALLUSERSPROFILE%\chocolatey\bin"
Download Keyboad 1337.zip. Unblock. Unpack. Install. It which has a dependency on Autohotkey. If these 3 issues aren’t a problem in you case, be reluctant to use an O/RM as an O/RM brings a bunch of other problems. When you get the Customer.Verified out of a database the code already knows it is a boolean. No explicit type casting or declaring is needed as it is done elswhere, once and for all. Copying data from a recordset to the Entity is done by the OR/M and configured once and for all. Unlike a programmer it won’t forget to copy a field in an obscure corner in your code base. It isn’t hard to write a data copying function for this simple case and dragging a whole OR/M into the project is a lot of dependencies for little use. When the scheme is changing fast, like in the beginning of a project, or when prototyping, an O/RM is of great help to change in one place and let the coding tools and compiler do the rest of the changes in the project. Schemes tend to solidify after a while and only change in small increments so speeding up the first 3 months for having a rucksack the coming 6 years might not be the best solution. A tablet is not only for onsuming what other people have done. You can too. Also a kid can. Create your own side scroller. There is also hardware if you want. There is not a clear goal, just fiddle around. For good and bad. It is like making movies in ScratchJr but only side scrolling and less effects. It is like Lightbot but side scrolling and with funnier characters. The goal is somewhat funnier compared to lightbot; getting a donut for a (US) police officer instead of just lighting a light bulb. To try it out there is an older? version on the web. Hard to use computer interface. Make a little robot find her way around stairs and obstacles. Also see https://www.dexterindustries.com/BrickPi/program-it/scratch/ for using Scratch with Raspberrypi. Wireless/WLAN/Wifi did not work when I upgraded my Surface Pro Win8 to Win10. My resolution was to go to the devices and remove a WLAN driver (Marvell Avastar 350N wireless network controller?) and right after that look for hardware changes in the same window. Unfortunately I did not take any screenshots and promptly forgot the accurate data. Setting up a new Web site and then connecting it to Sqlserver is a breeze if one uses the development web server. But if one wants to use the real McCoy, i.e. IIS, there is more work. Why use the real IIS when it is so cumbersome? Because it looks more like the real production environment. 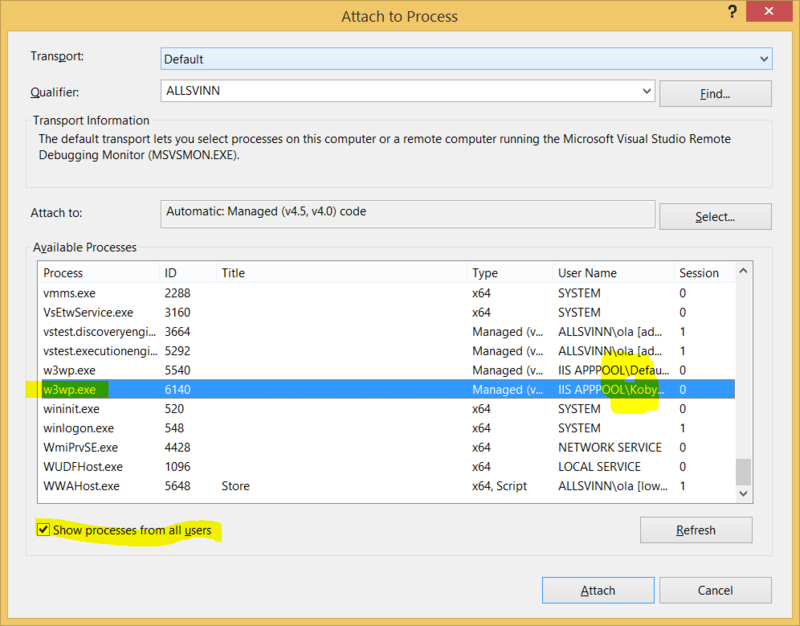 Then ctrl-alt-p (menu:debug:attach to process) and choose the w3wp.exe process, with the right user name. Attach. Debug. With VS2010; Blend was shipped as a stand alone product. With VS2012; Blend was bundled. Almost. The Blend that comes with VS2012 only does Win8 ModernUI apps. But there is a remedy: download Blend preview from here: http://bit.ly/U3Opxh. Login might be required. The article linked below doesn’t touch my usual rant about innovation and that there are things that cannot be owned. Instead it mentions that there is something built into software patents that make them unusable as patents.